We’ve all heard the phrase, “It takes a village to raise a child,” but one Georgia neighborhood found that it actually takes a village to raise a small orchid population. Called Big Canoe, this neighborhood is located in Pickens County, and is home to the Meadows Committee, a dedicated group of individuals committed to stewarding the Big Canoe Conservation Easement, held by North American Land Trust (NALT). After a NALT Conservation Biologist discovered the existence of the rare White Fringeless Orchid on this permanently protected Conservation Area, the Meadows Committee learned just how much work and coordination goes into rehabilitating a species. And thanks to enthusiastic partnerships and the hard work of everyone involved, this orchid was able to grow and flourish into a rare beauty. 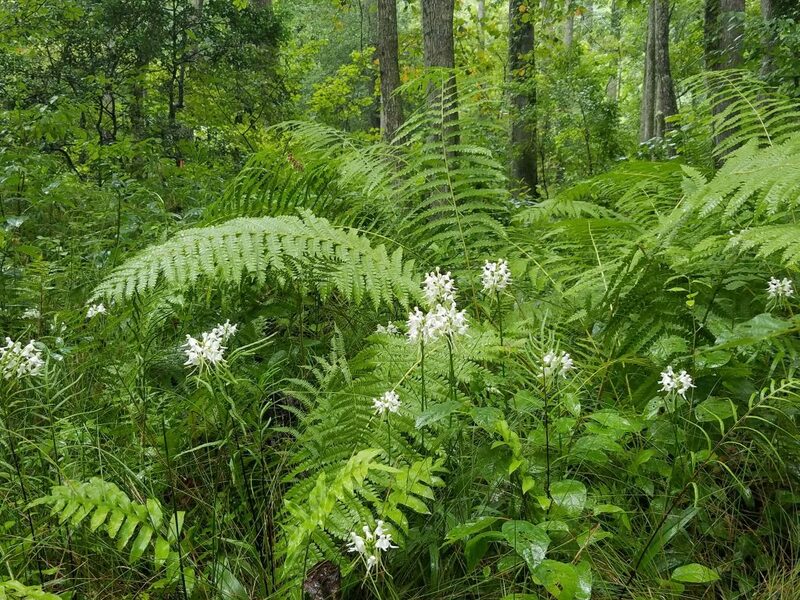 The story begins in 2000 when NALT worked with landowners to conserve more than 200 acres of land in the Big Canoe Conservation Area, which supports a rare Sphagnum bog, trails, footbridges, maintained wildflower meadows, and the Meadows Committee. The Committee’s initial task was ambitious, but they were devoted to their community and so undertook to restore a portion of the eased property to a more natural mountain meadow, using native plants from Georgia. 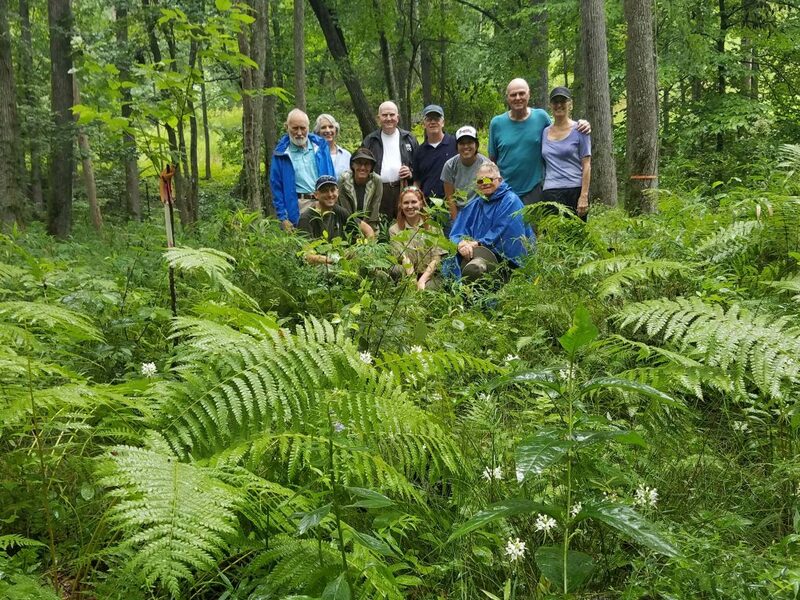 With the help of Walter Bland, owner of Rock Spring Farm, they managed to clear invasive plants and non-native vegetation, creating space to plant or transplant 700 trees, 600 shrubs, and several hundred wildflowers and grasses. But little did they know, their work was only just beginning. 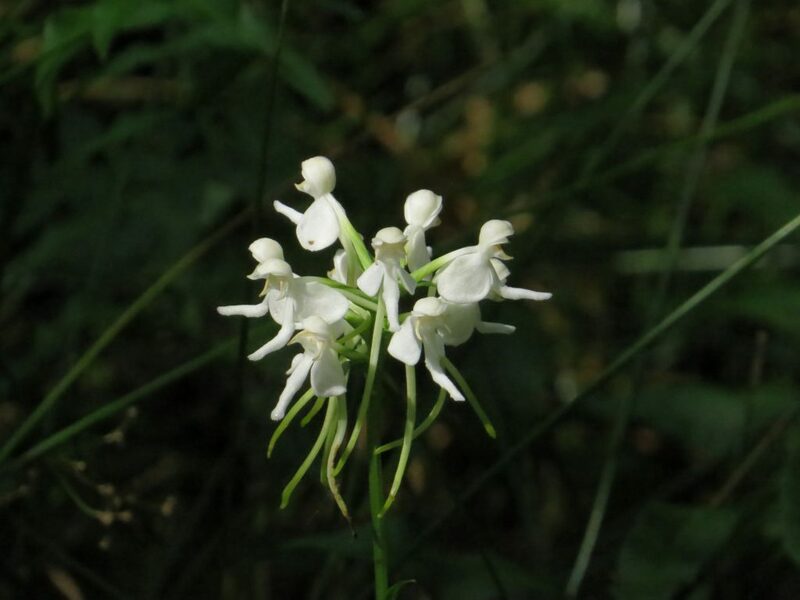 Later in 2012, NALT Conservation Biologist Lee Echols was completing a regular monitoring trip to the Big Canoe Conservation Easement when he stumbled upon a rare sight in the Sphagnum bog: Monkeyface or White Fringeless Orchid (Platanthera integrilabia). Known to exist at just 9 other sites in Georgia, this orchid is a candidate for federal listing as an Endangered Species. It has become scarce over the years, because its preferred habitat is bogs, which have been filled for development. With its white delicate petals and spidery shape, this orchid is very distinctive, and once Lee discovered it, he knew he had to act quickly in order to save this small and vulnerable population. Protecting the bog area from browsing and trampling by deer was the first order of business. In 2015, Walter Bland and the Meadows Committee installed a 750 foot perimeter fence, which has been successful in keeping both deer and people out. Next, they removed invasive plants and thinned trees to allow more sunlight into the area. And finally, Matt worked directly with the plants as a human pollinator, which proved to be a precarious matter, because natural pollination just wasn’t happening with these sensitive orchids. Luckily, Matt knew what to do. Using a pencil, he pollinated the plants in the bog by hand. As Matt described it, this method “is like space travel; if you miss your window, you have to wait a whole year.” When the pollination was successful, he collected the seeds and took them back to the Atlanta Botanical Gardens where he is germinating and growing them into healthy plants before planting them in their home at Big Canoe. And it looks like Matt made it just in time. This past year, when the Meadows Committee inspected the bog, they found a fantastic surprise: beautiful orchids in bloom. As Theresa explained, “Last year there were only 5 orchids and this year it’s over 30, and it’s just phenomenal. Our efforts were well worth it!” And in the grand scheme of things, those efforts made a spectacular difference. Thanks to the proposal writing and the many meetings that the Big Canoe POA has hosted throughout the Georgia, they have brought more awareness to plight of this lovely but rare flower. As a result of their educational efforts, it looks like it will soon be placed on the federal Endangered Species List. At first, that may seem like an unhappy ending, but once the orchid is protected under the Endangered Species Act, it can be recognized and properly protected with further support, thereby putting it on the path to conservation success. The continued partnerships between the Meadows Committee, NALT, the Atlanta Botanical Gardens, and Rock Spring Farm, give hope for the future of the White Fringeless Orchid. They demonstrate just how important it is to work together for the sake of conservation. As Matt explained, “If it weren’t for NALT’s easement, number one, we wouldn’t be working in this site; and number two, we wouldn’t even know this population occurred in Georgia.” This just goes to show that taking the initial steps to conserve land with a Conservation Easement, and entering into a permanent partnership with a land trust such as NALT, can help to save critical habitats, wildlife, and plant species for the future.